...have you tried it yet? You can compare your results with other people state-by-state and with people across the country. It's a quiz from iSideWith.com. How did I manage to agree with Mitt Romney and Ron Paul virtually equally? 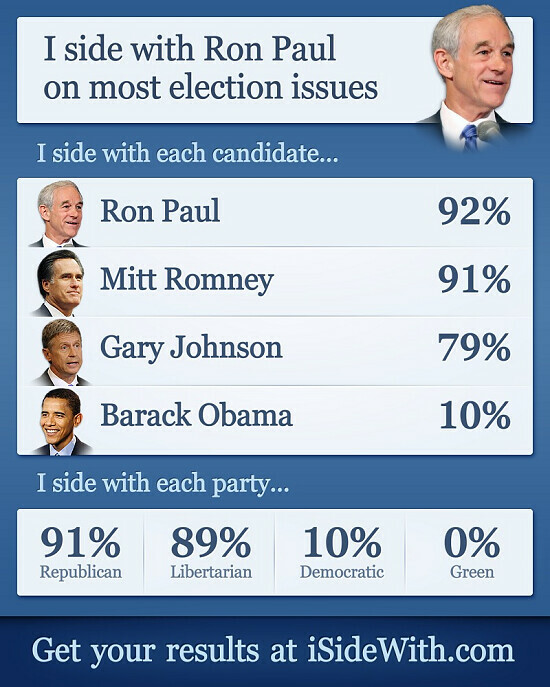 I was 99% aligned with Gary Johnson and pretty much a libertarian, which was no surprise. I would love to vote for Johnson, but I want Obama out more, so I am stuck with Romney. I look forward to another chance in 2016 for a libertarian in the White House. Romney leaves so much to be desired, but Obama is flat-out dangerous. Imagine Obama with "more flexibility" after re-election. I would like to be able to sleep at night, so I will pass on that thought. I came up Jill Stein 93%, but I heard her speak on a podcast, and I didn't care for her all that much. She kept saying how awful it is that people went into debt to get an education and can't get a job. I say those people can take advantage of hardship deferral while they go out and find someone with a need an fill it. Then those loans will be paid off before they know it. A college education gives you tools to meet people's needs, which in turn creates wealth. A degree is NOT a meal ticket.